A 15 minute video is now available of the talk I gave at the "REMIX CULTURE: Creative Commons and Creativity" symposium which occurred May 6th, 2005 in the UK. My focus was to present the Magnatune business model, discuss how our focus is on reuse, and summarize what the results have been in our two years of operation. I gave a few tips on the not-so-useful "commercial" vs "non-commercial" distinction (I don't think much is clearly "non-commercial" in today's world). Click on the image to the left to view the quicktime movie. More videos from the symposium are available at the Remix Culture symposium web site. CC Mixter and Magnatune are running a remix contest using two songs by Lisa DeBenedictis, in an attempt to make a Lisa D remix album that we'll then sell (the proceeds being split among the remixers). CC Mixter is currently hosting a remix contest featuring the work of Magnatune recording artist Lisa DeBenedictis with the entire Magnatune catalog of over 1,700 pieces of music available for source material. The creators of the top 10 winning entries (up to two winning entries per contestant) will get signed to a Magnatune recording contract and appear on a commercially available remix album. 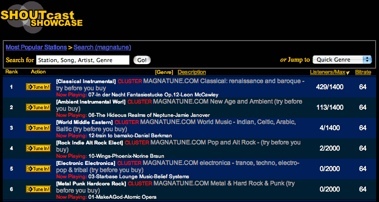 On the "open music" concept of Magnatune: I've long wanted to release "source files" to the music Magnatune releases, which really means single tracks, unmixed (so you can "compile" the tracks into a final new song). However, it can be hard to get these source tracks after the fact, especially if musicians paid a studio to make an album, and an engineer wants more money to go back and find the source tracks. As part of this CC Mixter contest, Victor and I went back to our musicians, and managed to get a half dozen artists to give use tracks to several songs. That's at least a start. If the remix contest is successful (and we're already getting lots of remixes!) I should be able to use that as leverage to get musicians to give me their multi-track sources to their albums. One other big issue came out was how the various CC licenses work (or don't) together. Since we release our music under a "share-alike" license that requires new works to be released under the same license, you cannot use other samples at CC Mixter in this remix contest, because those are mostly released under the more restrictive "sampling" license (we use the more general "derivatives" license) -- because if you made a work which used samples from both works (each with a different license), which license would the new work use? The answer: you can't, it's not allowed. I chose the "derivatives allowed" license for Magnatune, because it allows any transformation, even small ones. For example, a "mash up" of two songs playing at once doesn't seem like "sampling" to me, since the entire songs are present in the final (just mixed together), and might not be allowed by a sampling license. More tangibly, the sampling license doesn't allow a non-commercial film to use the music, since the music isn't being sampled, while the "derivatives" license does allow it. This legal stuff is important (the point of the CC is to get the legal stuff right, hopefully without lawyers) so we ended up restricting people to only use Magnatune sources (or public domain ones, or stuff they play themselves) in their remix. That's a strange consequence, but it's an important insight we (and the CC) have gotten from this, which is the first large-scale attempt to mix various music libraries to create new works. As reported a few weeks ago, I shut down the Magnatune Internet radio stations because I could not rationalize the $2.50/listener-slot/month cost. I decided to lower the cost by lowering the sound quality, from stereo-128k, to mono-64k. This reduces the cost by 75%, to $0.625/listener-slot/month as well as letting us support 4x the number of listeners on the same bandwidth. Since we had a fair amount of unused bandwidth after I shut the radio stations down, I thought I'd give it a try. So far, I've seen only a modest sales increase (under 5 purchases per day) that appear correlated with radio, and most listeners appear to be listening-only, and rarely surfing. But, since the bandwidth is currently paid for, I'll continue giving this a try. We're around a 1000 listener peak during the day. This article appeared today in a free London paper called "Metro". The interview/conversation of Martin (of Coldplay) has been widely reported, but I was especially amused by the "evil label" moniker of this article. UK Label Hyperion Records lost an appeal today, which they describe on their web site at http://www.hyperion-records.co.uk/. The issue in the appeal is that Hyperion published a CD which used a sheet music edition of a public domain work, but that the mere effort of making a clean modern edition of the public domain work was enough for the sheet music to be considered a new work, and worthy of copyright. No significant changes were made to the music (which is a requirement the US congress makes for accepting a copyright claim to a public domain work). This effectively means that the only way to record or perform a public domain work is to go to a facsimile (photograph) the public domain work, and to make your own edition. In the short, term it may mean money for sheet music publishers who sue labels who thought their CDs used public domain music. Longer term, it will damage the sheet music business, since the only legal use of purchased sheet music will be private/non-commercial performance, with any public performance or recording requiring additional licensing from the sheet music publisher. In the lead judgment of the Court of Appeal, Lord Justice Mummery held that: In my judgment, on the application of Walter –v- Lane to this case, the effort, skill and time which the judge found Dr Sawkins spent in making the 3 performing editions were sufficient to satisfy the requirement that they should be “original” works in the copyright sense. This is so even though a) Dr Sawkins worked on the scores of existing musical works composed by another person (Lalande); b) Lalande’s works are out of copyright; and c) Dr Sawkins had no intention of adding any new notes of music of his own (Para 36)"
Thankfully, this sort of copyright absolutism doesn't exist in the USA, but the UK is definitely a sophisticated marketplace: this is a not a backwater "odd-ball" legal case. A friend of ours who runs a classical label was watching this case closely as he feels it will severely impact the UK classical music label business.